The major aspects of Japanese bonsai, has not changed significantly over time. Japanese bonsai initially originated in Egypt thousands of years ago and moved to China. From China bonsai moved to Japan. Where the Japanese perfected the art of bonsai. The art of raising bonsai dwarfed potted trees has enabled the Japanese to admire nature in an indoor setting. The art of Japanese bonsai, as developed in America, is much freer in concept and style than Japanese bonsai. The quality of a bonsai tree is measured on how well it portrays nature in miniature form. 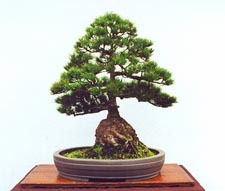 A bonsai should have a well tapered trunk and have branches all around the tree to give the bonsai visual depth. The art of Japanese bonsai involves the bringing together of tree and pot in visual harmony. "Bonsai" simply means "potted tree." But many of the really fine specimens have been pruned for more than 100 years.